In my previous post, I talked about the aspects of my Sunday night. 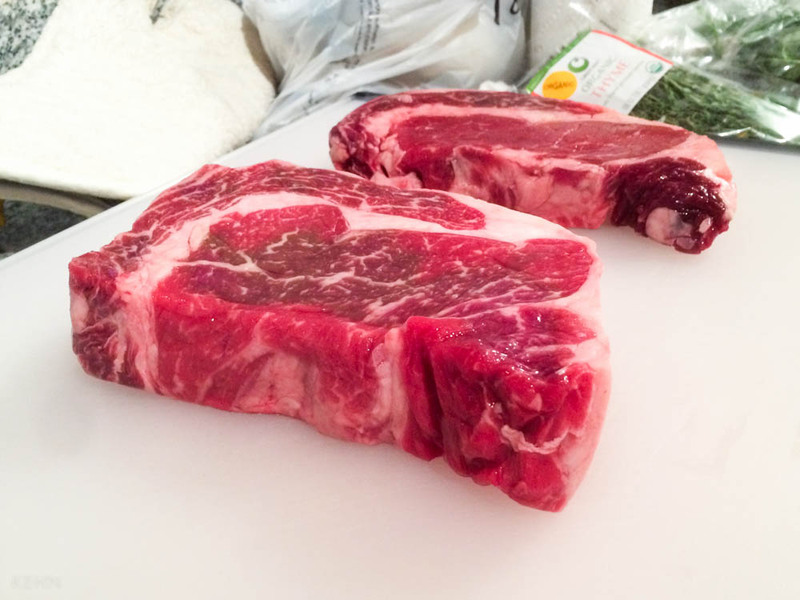 Today, I will talk about making the perfect rib eye steak. I’m starting off with some general background on the hypothetical “perfect steak” and what others have said about it. Skip to the steps to skip the prelude. 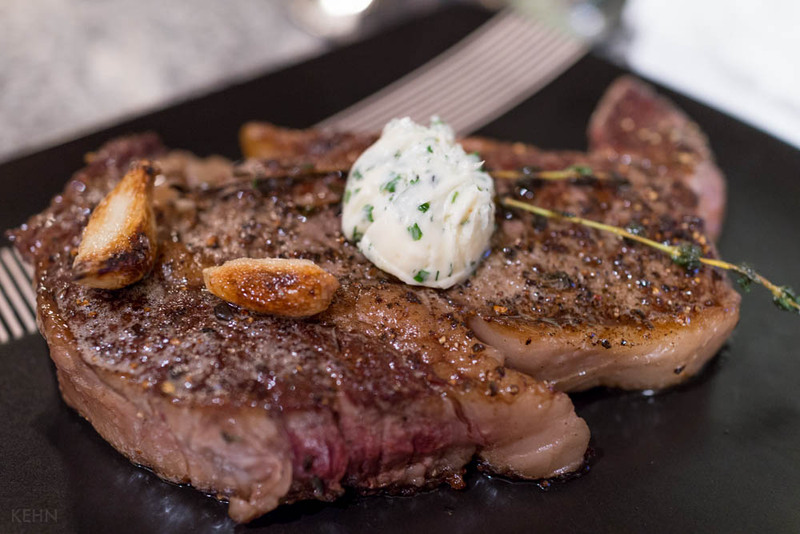 Both folklore and the internet have lots to say about how to cook the perfect steak. Pan or grill? How many flips? Oil, butter, or dry? Salt, pepper, or a rub? How long should it rest after cooking? All of these questions (and their answers) are found in my favorite guide to pan-seared steak on Serious Eats. They recommend a lot of flipping, butter basting, and cast iron. You can’t win them all - I’m using stainless steel. 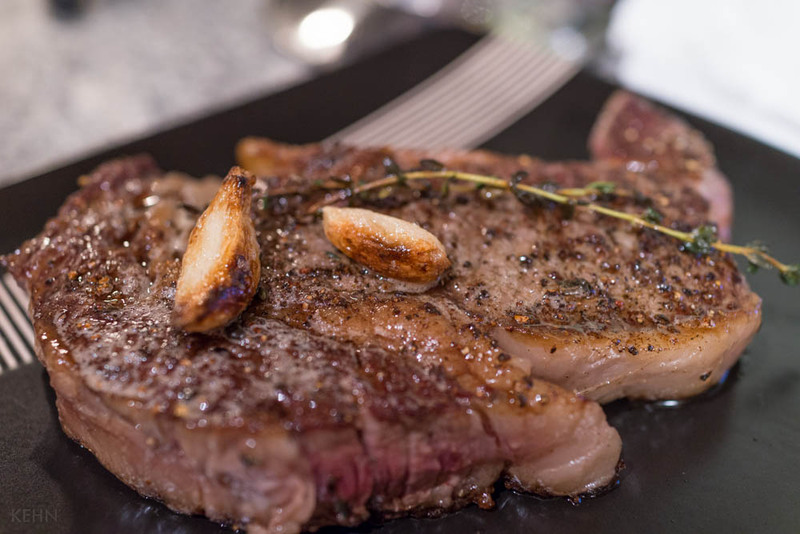 There are many cuts of steak to choose from, both bone-in and boneless. I’ll make this short: get a rib eye, and get it boneless. Bones aren’t fun to cut out of the meat, and they impair cooking. Meat shrinks as it cooks (this is the difference between uncooked and cooked weight.) Does bone shrink? No. Now a half-done steak has a significant amount of bone that prevents even cooking. I will compromise on the cut of steak selection. 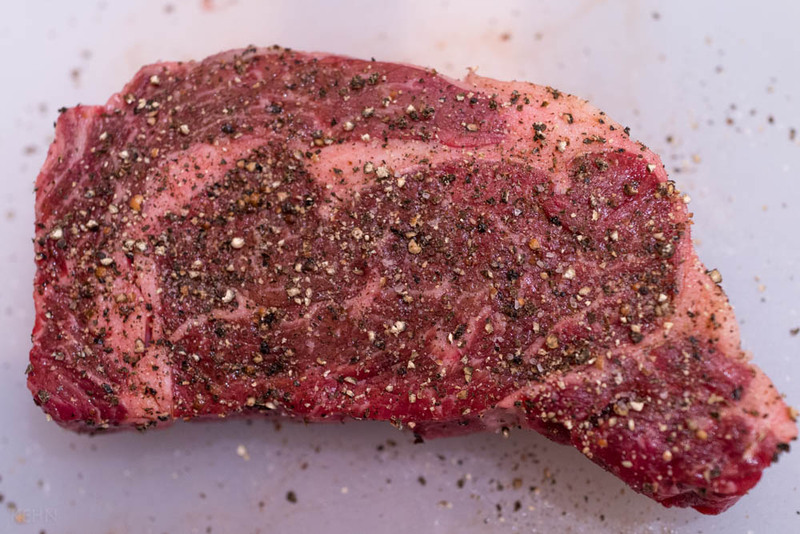 If you’re not a fan of that deliciously marbled meat, you can pick up a cut from the loin (strip steak) or try one of the alternative cuts such as flat iron, tri-tip, etc. Regardless of anything I, or anyone else, says, the perfect steak is the one you enjoy the most. Stop by the local butcher’s shop and talk to them. Ask them about the differences between grain-fed and grass-fed beef, the different USDA beef grades, and what their personal experience is with a particular cut. They deal with this stuff every day. Don’t avoid asking because of preconceived assumptions. More marbling = more fat = more flavor. Repeat it a few times. Preparation is key. A lot of comments have been made about pulling things to be cooked out of the refrigerator before cooking to allow it to warm to room temperature. Twenty minutes isn’t enough time for that, so I like pulling steaks out of the fridge an hour or more before cooking. Seasoning is simple: kosher salt and lots of coarsely ground black pepper. Season both sides well, and then let it rest at room temperature. The point here is to allow the salt to dissolve into the top layer of the meat and start breaking down the meat. Get a nice skillet out, either cast iron or stainless steel. Put it on high heat1 and let it heat up until a drop of water skitters over the surface. Add regular oil (canola or similar), enough to coat the bottom of the pan, but not so much that you’d be frying the steak. Adding the oil after heating the pan prevents it from breaking down as quickly and allows it to serve as a better medium for the steak. 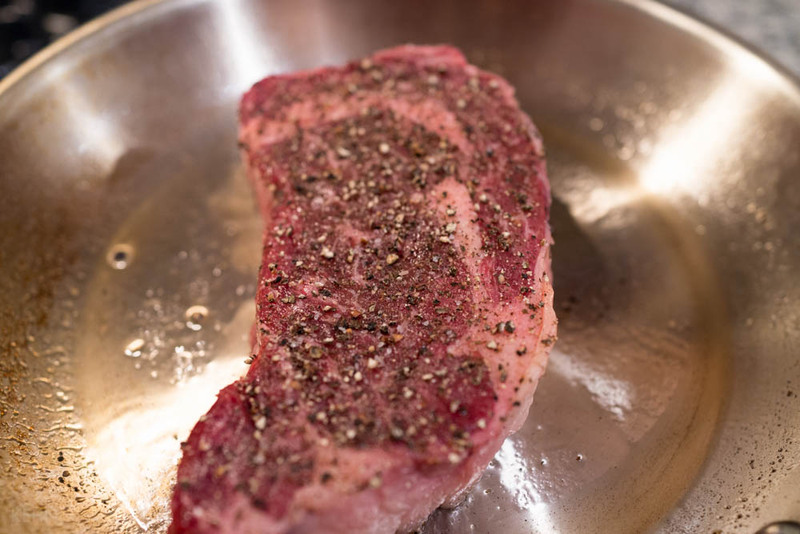 While the pan is heating up, take that steak you set aside earlier and pat the sides dry. Aim to eliminate any excess moisture on the surface to promote quicker browning and searing. Also grab an accurate meat thermometer and tongs to have on hand. Lay the steak in the pan. 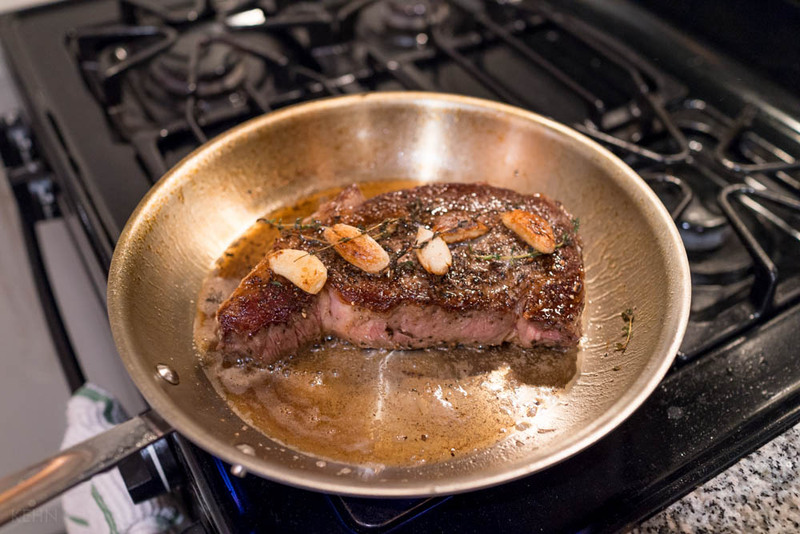 If it’s not sizzling, the pan isn’t hot enough - grab the steak and wait til the pan is hotter. Build up a nice even crust through regular and repeated flipping of the steak. After 3-4 minutes, start checking the internal temperature of steak regularly. For rare, aim for 120°F (49°C), medium-rare 125°F (51°C), medium 130°F (54°C). Anything more done than medium and you should be making burgers, not steak. Once the steak is 5°F (3°C) away from the target temperature, toss in a few crushed cloves of garlic, a few sprigs of thyme, and a knob of butter (~4 tbsp). At this point, turn the heat down to medium-high to avoid burning the butter. 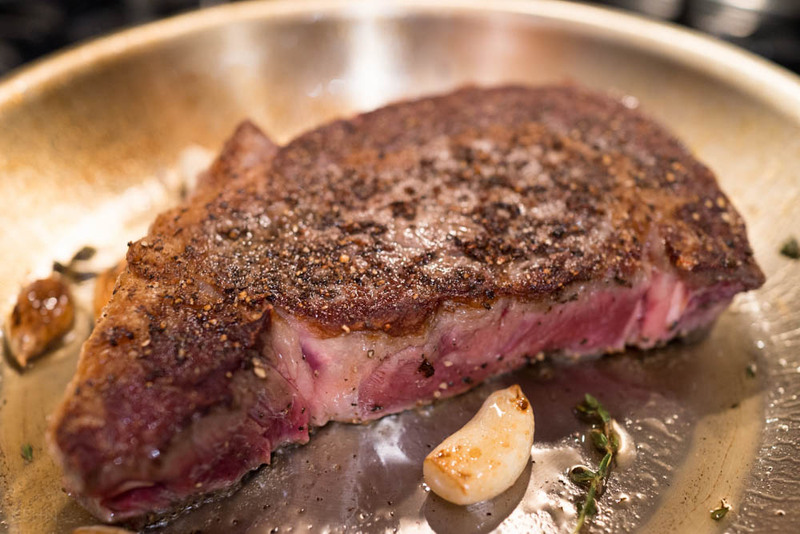 This is about adding color and flavor to the seared steak. A long handled spoon will serve nicely here. Baste the steak in the melted butter, garlic, and thyme. Flip it over and continue basting to improve color and temperature. Once the steak hits the target temperature, remove it immediately from the pan and let it rest on a plate. You can spoon some butter over it as well. Letting the steak rest for a few minutes is important. It helps cool the surface to something less tongue-scalding, and it continues to cook the steak slightly. After plating would be a good time to add some of that Beurre Maître d’Hôtel, mentioned earlier, to top off the steak. Dig in and enjoy!